Under Saudi Blockade, Yemen Torn By Competing Powers — And Facing Catastrophe : The Two-Way Saudi Arabia shot down a Houthi missile allegedly supplied by Iran. The "direct military aggression" — in Saudi words — prompted the blockade, which now has aid agencies fearing new crises in Yemen. 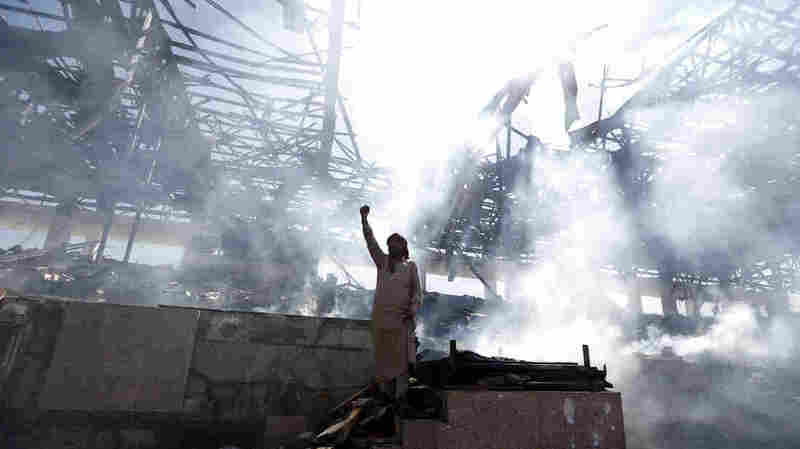 A Yemeni man stands at the site of an airstrike in the capital, Sanaa, on Sunday. Saudi Arabia's crown prince has accused Iran of committing an act of "direct military aggression" by supplying Houthi fighters in Yemen with ballistic missiles. Mohammed bin Salman's claim, stated in a phone call with the British foreign minister, comes just days after the Saudi military shot down a missile aimed at an international airport near Riyadh — and subsequently shut down land, air and sea routes into Yemen in retaliation. 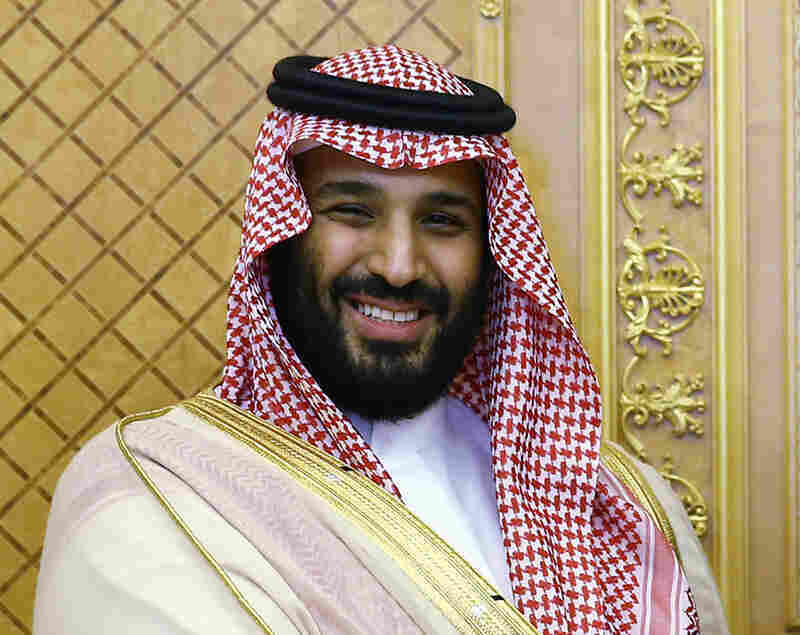 "The Crown Prince stressed that the involvement of the Iranian regime in supplying its Houthi militias with missiles is considered a direct military aggression by the Iranian regime and may be considered an act of war against the Kingdom," the state-run Saudi Press Agency said in a statement Tuesday. The agency also noted that Boris Johnson "expressed his condemnation" of the missile attack and reaffirmed the U.K.'s commitment to Saudi Arabia. Iran, for its part, denies playing any role in Saturday's attempted attack, which Human Rights Watch says "is most likely a war crime." The Houthi rebels — an Iran-backed Shiite militia that controls much of Yemen, including its capital, Sanaa — fired what has been reported to be a Burkan H2 missile at the airport, only to see Saudi missile defense forces intercept it in flight. Some fragments of the destroyed missile did rain down on King Khalid International Airport. "The Houthis' launching of an indiscriminate ballistic missile at a predominantly civilian airport is an apparent war crime," Sarah Leah Whitson, Middle East director at Human Rights Watch, said in a statement Tuesday. "But this unlawful attack is no justification for Saudi Arabia to exacerbate Yemen's humanitarian catastrophe by further restricting aid and access to the country." Indeed, the closure of Yemen's ports of entry threatens to worsen a situation that United Nations officials have also described as "catastrophic." As of Saturday, the World Health Organization was reporting that more than 900,000 suspected cases of cholera have been reported since late April in Yemen, where years of war and privation have debilitated the infrastructure and medical system. The WHO says the outbreak of cholera, a disease that under most circumstances should be both preventable and treatable, has claimed the lives of at least 2,188 people in that period. "They're lacking in everything from beds to basic medicines. Doctors said they didn't even have enough antibiotics," NPR's Ruth Sherlock told Morning Edition on Tuesday. Ruth, who just left Yemen this week, said it's not just cholera that threatens civilians in the war-ravaged country but random violence, as well. She said she met one 12-year-old boy at a hospital who "stood on a landmine just outside his home seven months ago. He lost much of his left leg and the toes on his right foot." And that's not to mention the food shortage that has ravaged Yemeni civilians, leaving 2 million children "acutely malnourished & at grave risk of dying," according to the U.N. Office for the Coordination of Humanitarian Affairs. "It is the worst food crisis we are looking at today, seven million people are on the brink of famine, millions of people being kept alive by our humanitarian operations," spokesman Jens Laerke told reporters this week, as Deutsche Welle reports. "If these channels, these lifelines, are not kept open it is catastrophic for people who are already in what we have already called the world's worst humanitarian crisis," said Laerke. As Ruth notes, both the U.N. and Doctors Without Borders say their flights have been grounded. And Saudi leaders, who say they've undertaken to stem the flow of weapons from Iran, have as yet shown no inclination to lift the blockade. The past week's events represent a significant escalation in what has become something of a proxy struggle between Saudi Arabia, a Sunni-led country, and a predominantly Shiite Iran. The two Gulf powers for years have been "engaged in a regional 'Cold War,' " as the BBC puts it, and Yemen's internecine conflict between the rebels and its exiled — but still internationally recognized — government has seen the intervention of a Saudi-led coalition since March 2015. The violence, which began with a Houthi uprising but intensified with the start of a sustained Saudi air campaign, has been locked in stalemate for some time. But it has continued to wreak a deadly toll: Al Jazeera reports that more than 10,000 civilians have been killed in the war. It has also prompted criticism of the U.S., which has at times offered the Saudis logistical and targeting support in their bombing campaign. The Kingdom of Saudi Arabia, or KSA, "bombs #Yemen to smithereens, killing 1000's of innocents including babies, spreads cholera and famine, but of course blames Iran," Javad Zarif, Iran's foreign minister, tweeted Monday. "KSA is engaged in wars of aggression, regional bullying, destabilizing behavior & risky provocations. It blames Iran for the consequences." And in Tehran, Iran's capital, The Guardian reports the anger with Saudi Arabia has pervaded cartoons and newspaper headlines such as this one: "Are we hearing the drums of war?" The U.S., which sells billions of dollars' worth of weapons to Saudi Arabia, waded into this war of words Tuesday with an allegation of its own: Citing Saudi information, the office of Nikki Haley, U.S. ambassador to the U.N., said a ballistic missile launched by the Houthis — and also shot down — in July was of Iranian make. It was "a type of weapon that had not been present in Yemen before the conflict, constituting violations of UN Security Council Resolutions 2216 and 2231," Haley's office said. "Saudi Arabia's announcement confirms once again the Iranian regime's complete disregard for its international obligations," Haley said in a statement. "The United States is committed to containing Iran's destabilizing actions and will not turn a blind eye to these serious violations of international law by the Iranian regime." Haley's office added that the missile launched Saturday "may also be of Iranian origin," supporting Salman's claim. Meanwhile, the U.N. continues to work to open Yemen's ports to humanitarian traffic again, as the group's deputy spokesman told The Associated Press. "We are in touch with our counterparts and we're trying to see whether we can get our normal access restored, and we're hopeful that we will be able to continue our normal operations."